Picture left: Mirco Patarini performing at the Teatro del Cremlino, Italy. Click picture for larger size. Q. You went to a private school when you were very young, and then you took part and won many national and international contests. One of those, perhaps, would undoubtedly mark your destiny, but we are going to talk about this later ... Why did you choose the accordion? A. I have an uncle, Franco, he was an accordionist since I remember him, a self-thought one. My parents wanted for my brother Moreno and myself to study music, in parallel with regular school, and so my uncle introduced us to an young accordion teacher from Spoleto, Renzo Tomassetti. He was a person full of enthusiasm and a great motivator. We learned very fast. Also, we immediately became passionate for participating in contests and traveling around Italy. We had the opportunity to meet lots of musicians and make new friends. Q. Do you think there are similarities between the methodologies and repertoires that you experienced in your training process and current programs adopted by various teachers of the conservatory? A. Without any doubt a lot has changed; at the end of the 70s the main method of study for accordion in Italy was based on piano technique, and in fact the piano accordion was much more widespread than button instruments. In these years accordionists experimented a lot, the use of the bellows was still somewhat rough, the free bass were already existing but not really thought. Teachers tried to experiment, talking to each other, they recorded the concerts and exchanged audio-cassettes. There were (few) teachers with a good musical education, but there was almost no teacher who was able to play at the level that the students reached soon. It has been three decades, but it seems like an eternity. Q. In the past, and I'm talking about the 80s and 90s, you were also the leader of an accordions orchestra (fisorchestra) ... What do you remember of that experience? A. As many private teachers in Italy and abroad, Renzo Tomassetti tried to involve as many students as possible to experience music together. It was not easy at that time to cooperate with schools of other instruments, and it was not even easy to get scores, or even prepare transcriptions or arrangements, to create groups of chamber music mixed. We do not forget also that the accordion, a little bit because of prejudice and a little bit for a reason, did not enjoy great reputation among the music community, and so the most logical answer was to create an Accordion Orchestra. From a musical point of view it was quite clear to us, very young students, that the result was mediocre or sometimes just decent, the problems due to the heterogeneity of the students and, above all, the differences of instruments, led to play somewhat orchestral or operatic music famous, however, to the joy of our families and the spread of the accordion around the city. I also met, however, accordion orchestras of very high level, especially with limited number of musicians. In any case, our 'Fisorchestra Santa Cecilia' did much to cement relations within the group of students that formed, and in some cases I remember mixed groups from different schools in the cities of Spoleto, Foligno and Terni. 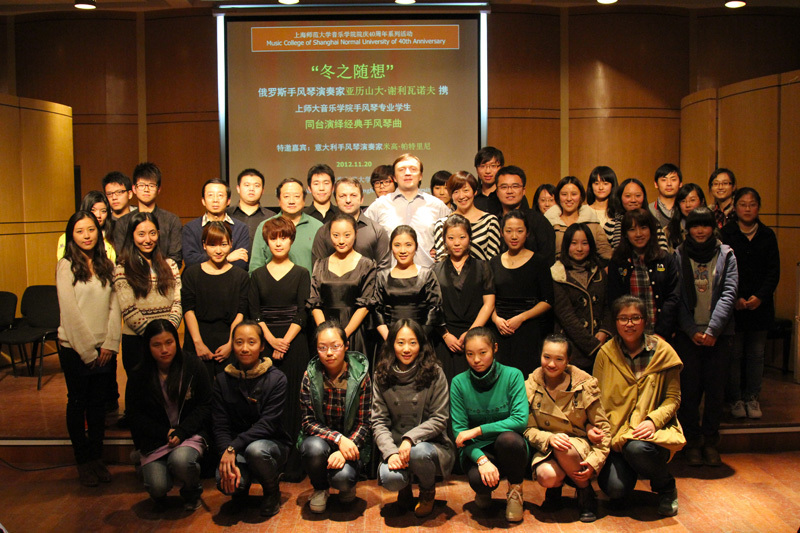 Picture right: Mirco Patarini seminar/workshop in China. Click picture for larger size. Q. Is there a particular accordionist who influenced "the way you play"? A. As I said before, during the first years of study the accordion was evolving, above all, in those years, at the level of instrumental technique. I remember with great pleasure Gervasio Marcosignori and Wolmer Beltrami, who I had the opportunity to listen live concerts many times. To be honest, the strongest impression was listening a concert of the Quintet of Warsaw, in Castelfidardo. An amazing group, I never ever heard again another group of accordions playing at that level. As I said, however, at this time we were listening music discs, recordings, which were not easy to find. And I loved an American LP with the compositions of Tito Guidotti, an extraordinary musician and composer, who nobody plays today, unfortunately. Q. Currently, do you think there are still big differences between the Eastern European schools, which have unquestionably dominated the scene of the recent past? 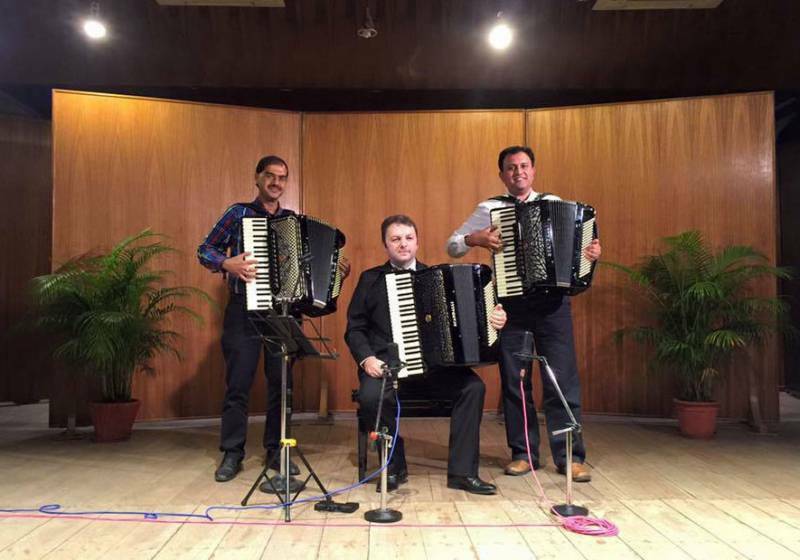 What do you think about the new generation of accordionists? What is the level of training in our conservatory of music and, in your opinion, is there a prominent feature among many? A. The school of the East? We can say school of (ex) USSR. It is not correct to say that the school of East dominated the scene, is not quite exact, there are many areas that have not been contaminated by the very Russian school and who have had very different developments, such as the northern European: Mogens Ellegaard in Denmark, one of the fathers of the "Classic" accordion, he always had many contacts and co-operations, among others, with Lech Pucnowski in Poland and also with Russian musicians, but his path and its evolution was very different. In Italy, we all know the great work of Farfisa company (The Farfisa Edition today is Berben) to create a repertoire and methods of study, so musicians like Gervasio Marcosignori, Luciano Fancelli, Felice Fugazza, became very popular. But we can not forget that Salvatore Di Gesualdo, for example, took a different route in his career. We need a treaty to deepen this issue .... Today, I believe that, apart the diatribes on the differences of instruments, there are also big differences on important musical issues, especially on the execution of pre-accordion music, or periods of Baroque, Classical and Romantic. I believe, however, that Italian conservatory of music, in general, is not inferior in any way to those of other countries. Obviously, the quality of each class school of accordion depends on the teacher .... we have, like for others instruments, excellent, good, and so so teachers. Personally, I have a particular fondness for Corrado Rojac, a truly talented studios of music at 360 degrees, but he is also a great performer. It is also true, however, that there are teachers with less musical culture but with a great capacity to motivate the students in a magnificent way, and to create good musicians also from ordinary talents. Picture left: Mirco Patarini and Alexander Selivanov performing in China. Click picture for larger size. Q. Do you feel you are more 'contemporary' or 'traditional'? What do you think about modern musical languages? A. This is another complex argument. I believe that, just like the whole culture, music is in constant evolution and the musical language continually seeks new opportunities. 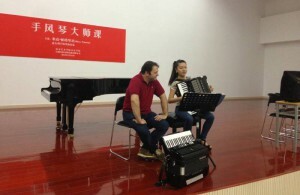 The exploration of the expressive possibilities of the accordion and phonic sound attract many composers, especially now, because many students are capable to use the technique very well. I like to follow with great pleasure the initiatives that combine in joint projects students of the conservatory accordion, composition and various other instruments. The problem is, in my opinion, that in many cases, intelligent composers, prepared, educated, cultured.... they miss that magical gift that elevates them to the status of artists, no more and no less it happens with painters, sculptors and artists in general. These attempts, however, are always appreciated, they are sometimes the beginning of composers who then grow in their career, in other cases the experiments remain important contributions to the repertoire or to teaching, both of accordionists and composers. Q. What system of free bass do you play and why? A. For several years I played with the quint system free bass, first the six rows and then to eight. After that I played for about one year a button instrument with c-griff free bass. At the end, I chose to keep the piano accordion with c-griff free bass. In any case I think the problem of the system is secondary to the music, you may very well play at a high level with any system... Corrado Rojac, which I mentioned before, played for years with the piano accordion quint sistem free bass and then he decided to change completely and play button instrument 'Russian system', both right and left. And we have not to forget, for example, Fabio Rossato, fantastic performer, playing even a c-griff button accordion to the right hand and a quint system free bass on the left. 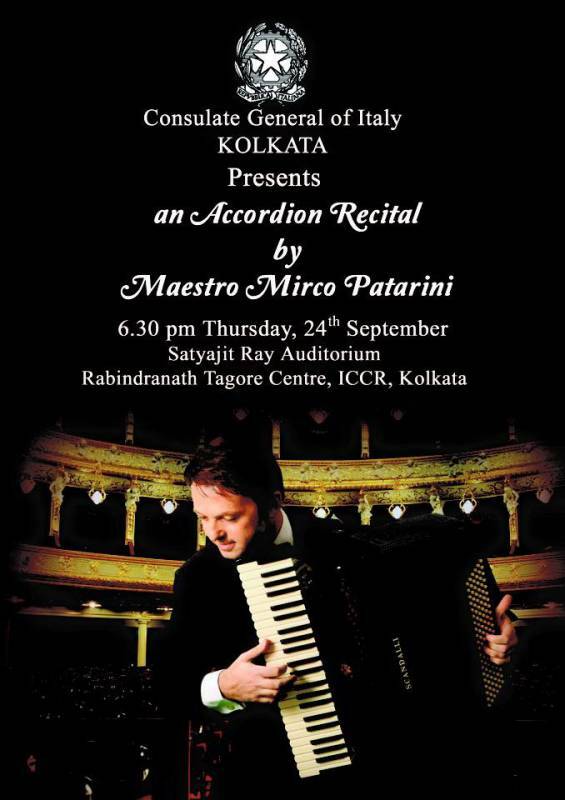 Picture right: Poster for Italian Consulate concert in New Delhi, India. Click picture for larger size. In addition to this variety of systems, we also have uneven pairings, more often than we think. It is clear that, even if from a musical point of view we can arrive to play well any system, such variety of configurations become a problem for didactics programs, and also for the production time and the costs of the instruments. My feeling is that we are moving towards the system b-griff on the right hand and the "Russian" to the left. I disagree with those who as a matter of "logic" or ergonomics, every system has conditions favorable or unfavorable depending on what you play. Q. What happened in 1984 in Switzerland? Can we say that from this moment your life had changed indeed? A. This argument about the contests, especially international, is long and manifold. I was thinking since a long time to write an article to explain very well my opinion; but I can say this: my life had changed indeed in 1981 in Castelfidardo, when I was 15 years old and I took part to the Trophee Mondial CMA. Try to imagine a 15 years old boy never went out of Spoleto, who suddenly discovers that there are in fact living Americans who speak English, Russian speaking incomprehensible language, and "Czechoslovak", Hungarian, Polish, Spanish .... and that all of them are boys and girls with their teachers, and they all play music, smile, eat and walk with me, they have the same curiosity and wonder. I remember a week when I gave myself an identity, a group of new friends with whom I communicated with difficulty, but to whom I felt much closer than to my classmates. When I returned to Spoleto I was different, I just had discovered that the world was large, and there were so many people to get to know. Without that experience, I would not probably have had the strength to overcome difficult moments. And in 1983, at the age of 17, always for the Trophee Mondial CMA, I started traveling to Venezuela, as well as the following year in Switzerland, where, finally, I won the first prize. I don't remember very well the contest, but I have a clear memory of my "performances" (also the mistakes ...), what had impressed my mind and heart were the people, the musicians, the new pieces, techniques never seen before, the faces of legendary performers or composers. 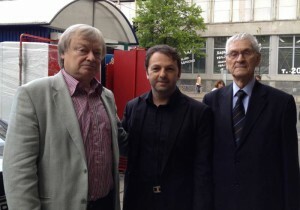 Picture left: Friedrich Lips, Mirco Patarini and Viktor Vlasov. Click picture for larger size. Q. In 1988 you started working with the famous company Farfisa-Bontempi. What do you remember of that experience? A. After graduating from high school, I had been without music for about two years, due to military service as a lieutenant of the army. At the end, I was not sure about my future (we are not to forget that it was not possible to study accordion at the musical conservatory), so I began to attend university and parallel teaching accordion in school with my teacher Renzo Tomassetti, who had an incredible number of students. 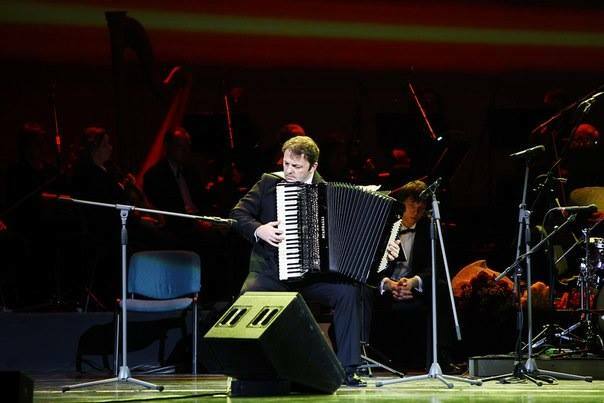 I was playing an accordion 'Bugari Armando', a man I had great respect and affection for, and sometimes he gave me the opportunity to play as a guest for some events. Also, I gained respect from Bio Boccosi. About this, I have a nice memory: I was in Rome in 1986, at the military school for the AUC (officer cadets) training, and everyone knows the rigidity of such training .... In particular way, for five months nobody gets permission to go home for any reason. In any case, at the end of 1988, I had the opportunity to contact the Bontempi company, who had just bought the Farfisa (1984) and Paolo Soprani (1986). The engineer Paolo Bontempi, among other interesting initiatives too long to tell now, started a production of accordions, in collaboration with two craftsmen of Castelfidardo, Leonardo and Luciano Menghini. Some years later I knew that they were looking for a musician for "endorsement". They tested many musicians before contacting me. Anyway, after a few months of 'trial', they offered me a special contract: I was hired as an employee, with regular salary, but with the permit to continue my studies in the way I found appropriate. I was really very quickly involved in the projects of the group, including the department of electronic keyboards and toys. Became musically responsible for the whole group, we are speaking about a company with about a thousand employees at that time and several subsidiaries spread-out the world. I was involved in many different activities and was traveling continuously throughout the world. Obviously, my training as musician could not be affected. For example, Farfisa had a science research center in a beautiful park in Paliano (FR), and I often went there. We were studying new microprocessors for the generation of electronic sounds, which were then used in the laboratories of Farfisa to design musical instruments, such as keyboards and synthesizers. The insights and experiences of those years gave me an important knowledge about the sound, all things that were not possible to study and learn in conservatories ... for example, the theory of harmonic sounds as itâ€™s still explained to the students is very superficial, it would be useful to study in a total different way. Andrea Bocelli being presented the prestigious Paolo Soprani Award by Mirco Patarini (left) with the Mayor of Castelfidardo Mirco Soprani (middle) and and Castelfiardo Festival Artistic Director Mario Stefano Pietrodarchi (right). Click picture for larger size. Q. 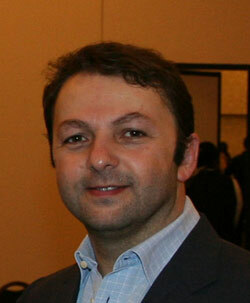 A few years later you decided to buy the Paolo Soprani and Scandalli brands: musician and entrepreneur at the same time. A. Bontempi-Farfisa group was very oriented in the production of mass distribution, especially in the field of musical toys. The management at all levels could not match the specific accordion needs, with its impossible industrialization, because this is an instrument made with methods of artisan production, with its own market and distribution, completely different. After a few years of trying, the management decided to stop the accordion department, and I, also thanks to my good personal relationship with Bontempi, bought the business unit, together with Leonardo and Luciano Menghini. We finished all the acquisition process in several years, it had not been easy, but the result today, and for many years, is that I'm a musician and an entrepreneur at the same time. This is absolutely NOT compatible to 100%, and in fact I do not think I do a really good job either. Q. Is there a something much more important, a particular element more than others during the construction, that adds value to the instrument? In a few words, what makes a real difference on an accordion concert ... The voices, the sounding board, the tuning ...? A. This is another important and long argument. What is certain is that the accordion is an instrument of quality craftsmanship, so quality comes from the quality of the artisans. But what complicates the situation is that, compared to other instruments, the accordion has an incredible variety of parts, completely different. I never knew any craftsman capable of doing a complete accordion alone. The main problem is that to make a great instrument, all the single parts must be excellent. A keyboard that does not work well also affects the sound, we can have excellent voices (reeds) but if they are not well assembled (or set), we are going to have an mediocre sound, worse than cheaper reeds, but assembled in a good way. Personally, to those who ask me what are the best instruments, I always recommend: try to test as much as possible, and then choose according to your taste. Q. Scandalli accordions are completely made inside the company. Is that right? A. Our company has a specific production department for wooden parts, we make the celuloid covering job, mechanical parts and keyboards; we buy voices or just some parts of them and other details, but sometimes we produce them (for example the valves of the keyboard or mechanical) ... in general, apart from the bellows that always buy from specialized suppliers, we have a structure that, if in over production, may buy more processing externally; but usually we always try to do as much as possible inside. Q. Which markets are the best for your company? A. We sell all over the world, like our main competitors. What people sometimes forget, is that there are not "big" companies of accordions as those of the years '50s-'60s-70s. We are all small companies and therefore it is impossible for each one to operate in all the markets around the world. So it happens that we are more or less present in some countries and other competitors - in others, where we are not. 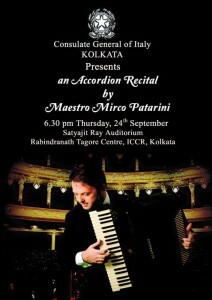 Mirco Patarini on stage in India. Click picture for larger size. Q. Now do you feel much more musician or entrepreneur? A. It's a good question. I do my best in both fields; to be honest I can say that I feel much more musician. Music is always present in my mind, not numbers and market strategies. Q. What is your role in the Confederation International des Accordeonistes (CIA)? A. In 2014, at the CIA Congress in Salzburg, I was elected Chairman of the Music Committee and I'm also part of the CIA Executive Committee. It is an elected office: the CIA is a confederation made up of members from around the world (now about forty), associations, conservatories, schools etc., and was founded in 1935. There are many discussions about these organizations, but if a Confederation born in 1935 still exists today, without interruptions, and is also part of the International Music Council of UNESCO, we have to recognize its great value. The CIA has had ups and downs over the years in its activities, I had been involved several years ago and now I am asked for a direct commitment in several projects. Q. You previously spoke about the Trophee Mondial. Is there some particular memory you have kept jealously for yourself, an experience that gave you gratification? A. I really had a lot of satisfaction, I can not choose among them in particular. But I can tell you about one "negative" situation that made a deep impression on me, for which I realized I was unprepared: the first time I played with an orchestra, for example ... I realized all along that to grow up we need "difficult" experiences. Q. 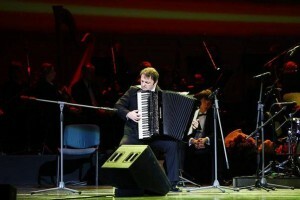 This question is for Mirco Patarini the musician: is there still skepticism about the accordion among musicians? What do you think is the future of our dear "accordion"? A. It depends a lot on the country ... In Europe, in general, I do not see, as when I was a young student, a closure of cultural environments in top music. In fact, it seems to me that the accordion attracts more and more interest. This obviously comes from the widening of the repertoire, from courses of conservatory of music that produces students of high quality, not like in the past when very few accordionists were truly capable of giving a concert. Think about the "classical accordionist", when was opposed at the time, a little laughed, a sometimes accused of not being a professional musician. But I would say that classical musicians, at that time, also had their good reasons. Q. This question, instead, is for Mirco Patarini the 'businessman' ..... Do you think the accordion can be technically improved or we reached the top? A. Yes, I'm sure we can improve the accordion alot more. In my opinion, the sound can still be improved both in power and in balance. It is a big problem, because inside a concert instrument there are more than one thousand reeds and adjust each one (it's a manual work!) to be reactive in a homogeneous way, both in the low sound and all the dynamic levels, is very difficult. Today there are now better ways to produce, for example, voices without a large part of the work being done by hand. There are, however, technologies to produce voices without manual intervention. But the main problem is that these technologies require investments too big for our companies, also because our business market has not sufficiently large dimension. We have the same problem with the materials used for the metal components ... how many times accordionists dreamers asked me, for example, about the titanium ... then, when I explained to them the reasons that preclude the use, I seemed to see a similar reaction to when a child discovers that Santa Claus does not exists. This does not mean that these technologies will always be out of the accordion production. I believe that slowly, we would integrate more and more the results of other research fields, such as 3D printing, which will bring great benefits. In any case, for me, there are two aspects to work on: the sound, intended not so much as a tone, but as a balance between the various reeds and dynamic possibilities, and the weight reduction. 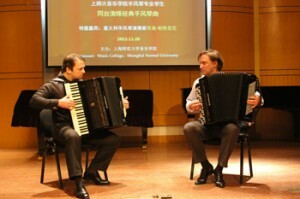 Picture right: Mirco Patarini and Alexander Selivanov in Shanghai, China. 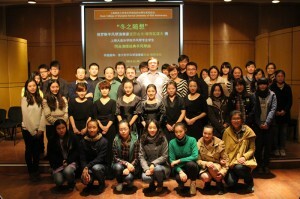 Picture after seminar and concert. Click picture for larger size. Q. Do you think that Castelfidardo city will keep the leadership in the accordions production or you see other cities, for example in Eastern Europe, to be more important in the near future? I have visited factories in Russia, in China, in Brazil; I can say that the way they produce accordions will make it very difficult for them to imitate the excellence / quality of Castelfidardo. It is clear, however, that events or processes of great international importance may unpredictably change the planet. We'll see. A. I would love for young boys and girls to choose to study music in general, doesn't matter which instrument. I think every family should consider the possibilities of giving their children an important music cultural background, over sports, the study of foreign languages etc. We always have to remember that the progress in the world stems in well educated minds, stimulated in their cultural item. Music, in my opinion, more than any other kind of art, is capable of touching the soul of everyone. To play music, at every level, is a great satisfaction for our souls and is also a good way, for children and adults, to discover the best of ourselves.